Kampala Lord Mayor Erias Lukwago has indefinitely suspended authority meetings. This followed the stalemate between KCCA technical wing especially the directors boycotting the meetings. Kampala minister Beti Kamya ordered the directors not to attend the meetings, which she described as null and void, in a January 25 letter. “There is nothing called resumed meeting in the KCCA Act,” Kamya stated. At the same time, the directors headed by the deputy executive director Samuel Sserunkuma said the city councillors held them hostage for one hour, in the last meeting. Basing on that, Sserunkuma said, they would not attend any meeting for security reasons. Mr Lukwago is not just having battles with the technical wing but also with the division mayors. The mayors accuse Lukwago of blocking the five city divisions from autonomy, something Lukwago denies. 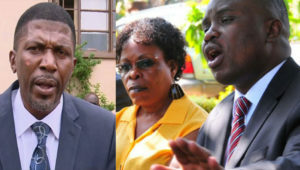 Ronald Balimwezo, the Nakawa Division mayor told PML Daily that they fell out with Lukwago because he refused to include thier inputs in the KCCA budget frame work. “The public should ask why he has failed to work with everyone,” Mr Balimwezo asked. The mayors support the amending of the KCCA Act, which will empower divisions. The mayors and division councillors fronted this matter before President Yoweri Museveni last year, who then instructed the minister of finance Matia Kasaija and KCCA technical wing to speed up the process. This can only be achieved, according to Balimwezo, if the Act is amended and powers are decentralised. Sources say that Lukwago is fighting the Bill currently, before Parliament because it reduces the powers of the Lord Mayor’s office and vests more power in the Kampala ministry. “Kamya and her group want me to be ceremonial Lord Mayor but we shall see who will win this battle. I am not opposing decentralising the power and responsibilities to the divisions but Kamya is just hoodwinking the mayors. Her main target is to weaken my office,” Lukwago explained. The most contentious section under the KCCA Act, is Section 11, which make the Lord Mayor the political head of the city. Kamya, however, said this contravenes the Constitution, which makes the President the head of every institution in Uganda. Lukwago remained tight-lipped after suspending the meetings, making his next move hard to predict. However, analysts are say if the situation is not contained, he might be impeached. In 2013, Lukwago was impeached by NRM majority councillors, citing and abuse of office. He went to went to court, challenging it and he was reinstated in the office for short period but another court nullified it.